From “Beauties of the Floating World Compared with Flowers”. 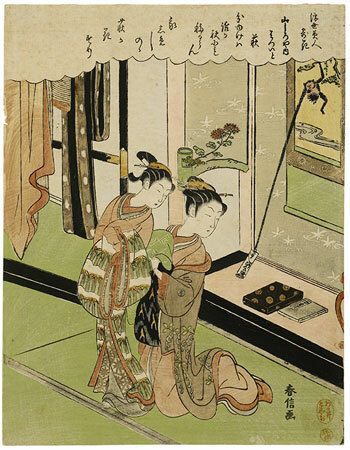 Harunobu and Bunchō began producing works like this, using the kimekomi-/kimedashi printing technique (embossed contours), around 1770. Harunobu also loved amusing innovations, as in this picture in which a little monkey from the hanging scroll comes to life. The movement of the girls is echoed by a flowing parallel rhythm of the hanging garments on the left. Many prints of the late 1760s and early 1760s, particularly those by Harunobu and Bunchō make use of a technique called kimekomi, in which the outlines of certain folds and contours of the garments are embossed, as here. Kiritsu Kōshō Kaisha, the first company formed for the exportation of Japanese works of art opened in Tōkyō in 1873 under the direction of Gisuke Matsuo and Kensaburō Wakai in 1873. In 1877 a branch was opened in New York, and the following year, coinciding with the International Exposition, a branch opened in Paris as well. Tadamasa Hayashi, perhaps the most influential figure in the introduction of Japanese art to the west, and of 19th century European art to Japan, began his career as an employee of this firm, leaving it to open his own business in Paris in 1884. In 1891 the original business begun by Wakai and Matsuo went bankrupt and closed, but during its years of operation it exported priceless works of art of all kinds to Europe and America. Prints that were sold by Kiritsu Kōshō Kaisha bear the seal of Kensaburō Wakai. Prints with the Wakai seal are invariably fine, remarkable often for their rarity as much as their outstanding freshness or design. Tadamasa Hayashi also affixed his seal to prints that passed through his hands. Hayashi collected prints personally, and it is possible that Wakai did as well. The presence of either seal is an assurance that the print left Japan in the last quarter of the 19th century. Reproduced in J. Hillier, Suzuki Harunobu, Philadelphia Museum of Art, 1970, no. 131. Ingelheim catalogue, no. 27a (colour).